Sen. Heidi Heitkamp (D-ND) told Breitbart News in an exclusive statement on Wednesday that she has “always supported increased” border security and wall funding and that she hopes to avoid a government shutdown that would arise from a fight over partially funding President Donald Trump’s border wall. Sen. Joe Donnelly (D-IN) came out early on Wednesday in favor of partially funding President Trump’s border wall in the September spending bill, hoping to avoid a government shutdown before the 2018 midterm elections. Sen. Joe Manchin (D-WV) told Breitbart News in an exclusive statement on Wednesday that he plans to support funding Trump’s border wall funding in the September spending legislation. “Sen. Manchin supports President Trump’s $5 billion border wall funding,” Jonathan Kott, Sen. Manchin’s communications director, told Breitbart News. President Donald Trump has threatened to shut down the government before or after the 2018 midterm elections. However, he said that he would “personally prefer” to have the shutdown fight before the elections. Given Sens. Manchin and Donnelly’s support for border wall funding, pundits have wondered whether other red-state Democrats such as Sens. Heitkamp, Jon Tester (D-MT), and Bill Nelson (D-FL) will support partially funding Trump’s proposed border wall. Sen. Heitkamp faces a tough Senate re-election this upcoming November against Rep. Kevin Cramer (R-ND), who has capitalized on President Trump’s signature issues such as immigration and building a wall on America’s southern border. A July Axios-SurveyMonkey survey found that Rep. Cramer leads at 52 percent, while Sen. Heitkamp has 47 percent among registered voters. Sen. Heitkamp’s office pointed to several times that she voted for border wall funding on many occasions. In 2018, Sen. Heitkamp voted for the Sens. Agnus King (I-ME), Mike Rounds (R-SD) amendment to the Immigration Security and Opportunity Act, which would provide $25 billion for northern and southern border security over the next ten years. The North Dakota Democrat also voted for an amendment to the Secure and Succeed Act, which would provide $25 billion for border security. Senate Judiciary Chairman Chuck Grassley (R-IA) sponsored the Secure and Succeed Act, which President Trump endorsed. Heitkamp also voted for $1.6 billion for border security in the Department of Homeland Security’s (DHS) appropriations bill. Sen. Manchin also told Breitbart News on Wednesday that he voted for the same bill, which would fund over 65 miles of the border wall. 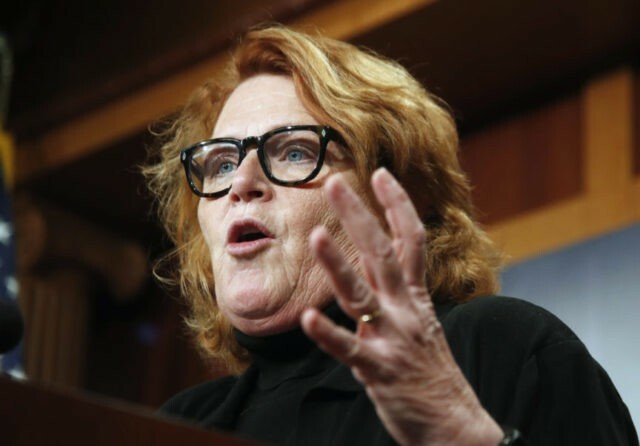 “The issue is, are we spending the money in the most economic and efficient way possible that actually makes a substantial difference in securing the border – and reflects what landowners, tribes, and border patrol agents along the southwest border all agree is needed,” Heitkamp explained. The Federation for American Immigration Reform (FAIR), a leading immigration group, said last year that a “physical barrier on the southern border is a necessity” if the government hopes to secure its southern border. The North Dakota senator then contended that to truly secure America’s border, both parties need to cooperate on comprehensive immigration and border security legislation, such as the 2013 Border Security, Economic Opportunity, and Immigration Modernization Act, which passed 68-31 through the Senate.